Girls Of The North Rejoice! 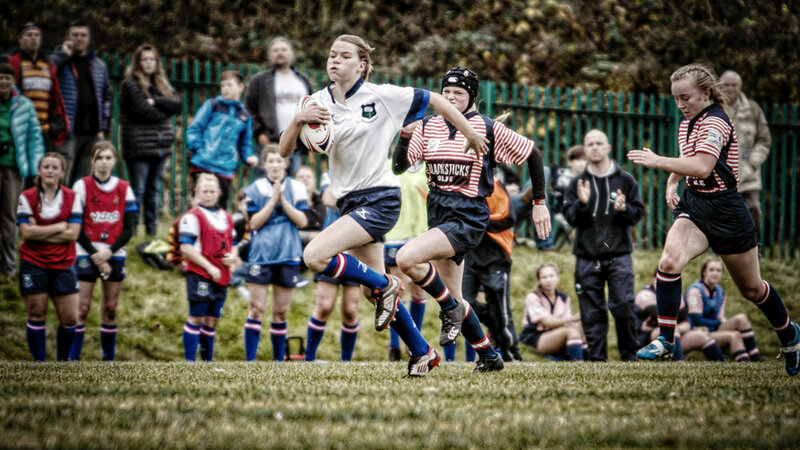 It was a grand meet up, a jamboree, a celebration of the growing popularity and increasing quality of girls' rugby union in the North of England. On one Sunday afternoon the best players at Under 15 and Under 18 level from Yorkshire, Lancashire, Cheshire, Northumberland, Durham and Cumbria came together in Doncaster for a feast of skill, grit, aggression and sheer enjoyment. There were six matches in all - three at each age level - the fixtures being Yorkshire against Lancashire, Cheshire versus Northumberland and Durham taking on Cumbria. To be honest, ickledot's had to check most of the scores. It was perhaps easier to follow the cross-Pennine clash as it came first, both ages kicking off at the same time. With the Under 15 games being a tad shorter they became more staggered as the afternoon progressed. Yorkshire Under 15s overcame Lancashire by a score of 42 - 5 in a game which was much closer and hard fought than the score suggests. Full match report here. Yorkshire's Under 18 girls were also successful, also scoring over 40 points but Lancashire put together some good moves of their own, scoring several tries and amassing 17 points. Again, you can read a full match report here. Trying to keep up with the Cheshire Northumberland clashes was really difficult, particularly as they were going on at the same time. Both counties seemed to have dominant sections of their respective games. And now, looking to their websites and social networks, ickledot cannot find a mention of their results. So, it's a guess until you correct or confirm! ickledot thinks that Northumberland won both. Apologies to Cheshire if that's not the case. It's a similar tale with Durham and Cumbria. It seemed as if the former had the edge but a victory for either county would not be a surprise. As regular readers will know, the usual form is a few pictures to accompany the blog and then an invitation to view more elsewhere. However, on this occasion ickledot was photographing for a film company, Damage Cat Productions, who are currently creating a piece about the development of the women's game, entitled Warrior Queens. So they've got first dibs on the pictures - more will be released as soon as they've got the ones they want. Don't worry, there are hundreds! Thanks to Damage Cat for allowing ickledot to show these few. Post Script: A day later and a reliable source has informed ickledot his estimates of the scores above were almost completely wrong. He was pretty accurate with Northumberland and Cheshire being reasonably close, the former having 35 to Cheshire's 19. At U15 level it was extremely close at 22 points each. In the third set of games the scores don't reflect well on the effort put in by Cumbria. Unfortunately they didn't manage a point, going down to Durham U18s by 68 and by 46 in the U15 game.